I was curious as to this Gelbison fellow —perhaps John Thrace Mardoon (1740-1807), third duke of Gelbison, little-known but less-remembered idle-rich British wag, fop, wit and Grand Tourist who wrote Travels Alone for They All Despise Me. He managed to get a mountain named after himself in the wilds of southern Italy and the name stuck. Not really. Actually that person never existed, but there is something to that business of a name sticking, although from a quite different and unexpected source. 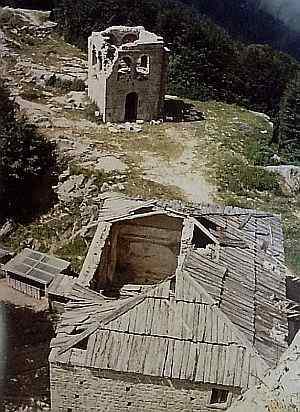 The name comes from Arabic, gebel-el-son, "mountain of the idols," a strange name, indeed, to have stuck to the site of an important and impressive sanctuary dedicated to the mother of Christ, the Sanctuary of the Madonna of Montesacro (Sacred Mountain). The sanctuary is at the top of Mt. Gelbison at 5500 feet (1,705 meters)—not high by absolute standards, but the second highest mountain in the Cilento, the southernmost part of the province of Salerno and within the boundaries of the Cilento and Vallo di Diano National Park, above the towns of Novi Velia and Vallo della Lucania. From the top of Gelbison, from the square in front of the main church, when it's really clear you can see Mt. Vesuvius 65 miles (108 km) to the northwest and the island of Stromboli in the Aeolian group 100 miles (160 km) to the south. 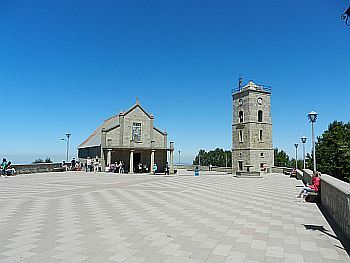 The site as it exists today—the completely rebuilt main church of the Madonna of Montesacro, the secondary church of San Bartolomeo, the belfry, the gardens, the walkways, the path up along the Stations of the Cross, the spacious square, the facilities/accommodations for visitors, the helicopter pad (!) (plus the nuns who chopper around in them! ), the photovoltaic panels to generate electricity from sunlight(! )—and I almost forgot—the road itself, miles of winding roadway to allow access for modern vehicular traffic—all of that is the result of 40 years of intense rebuilding after a thousand-year history. And that is only the part we can really document. Before that, there is myth, tradition and speculation—also interesting. In the realm of the speculative, supported by hand-me-down oral tradition, the first historic people to have lived on this mountain top may have been the Oenotrians, an obscure early Italic people who, some sources say, came from Greece as early as 1100 BC to inhabit the southern coast and then were pushed inland to the north as later immigrants arrived to start building the great cities of Magna Grecia. Recent on-site archaeology during the rebuilding of the church has, indeed, uncovered remnants of what appears to be a Heraion, a small shrine to the Greek goddess, Hera (also see this link). It is a rediscovery of sorts since the first documented medieval inhabitants were Basilian monks* in the second half of the 10th century AD who are said to have noted its presence. Those monks are believed to have fled Sicily after the Arabs took over the island in around 800 AD. It is not clear from any documentation what pre-Christians might have called the mountain. The modern Arabic name —and its subtle difference in meaning (that is, not "sacred mountain," but rather "mountain of the idols"— is interesting but impossible to pin down other than that there were, indeed, frequent Saracen (Muslim raiders; first Arabs, then Ottoman Turks) incursions along the southern coasts of Italy for many centuries after the initial expansion of Islam in the Mediterranean beginning in the 8th century; the raiders might simply have referred to the non-Muslim mountain hideaway as a place for the idolatrous. Christian terminology, at least by 1131, during the reign of Roger II (founder of the Kingdom of Sicily, later to be known as the Kingdom of Naples and also Kingdom of the Two Sicilies) was Rupis Sanctae Mariae (Rock of Holy Mary). The property was officially acquired by the Celestine order in 1323. There is extant documentation of an inventory of the premises (Troccoli, 2011, pp. 129) undertaken in the year 1700 that describes the church and small adjacent chapels as well as out-buildings for animals, etc. In the 1960s it looked like this! The real problems started with the Napoleonic rule of Joseph Bonaparte (Napoleon's brother) in 1807. All monasteries under French rule in Europe were expropriated by the state. Decay set in at Montesacro. An early attempt to start reconstruction in 1858 came to nothing.That was on the eve of the unification of Italy, an event that was itself another disaster for monasteries, even for those that had been permitted to reestablish themselves after Napoleon's departure and the restoration of the traditional monarchies 45 years earlier. The new Italian state reconfiscated the properties in 1861 and Montesacro went into a tailspin from which it did not recover until the 1960s. The item in the bibliography cited as Troccoli (2011) is the culmination of the author's years of researching and writing about the Sanctuary of the Madonna of Montesacro, beginning with his university dissertation (1986-1). In the introduction the author recalls how years ago he was so saddened by the seemingly insurmountable difficulties of reconstruction that he vowed never to set foot on the site of the sanctuary again. He then recalls the experience of witnessing the unbelievable—that is, he couldn't believe that it had all worked out. It is, indeed, hard to believe, but work out it did. Spectacularly so. The site is once again an active pilgrimage destination for those dedicated to the Madonna. It is new and modern, but not totally so; when you—modern motorized pilgrim that you are—leave your vehicle down in the parking spaces, there is still quite a hike to the top. You will pass a large mound of stones piled up incrementally, stone by stone, by the many pilgrims who have gone before you. I know a woman from the town of Montano Atilia in the hills to the south some miles distant who tells me that one of those stones is hers; she brought it with her as a young girl when she made the hike from her home. She placed it with the others and started up the final stretch, a long path and then around a curve past the Stations of the Cross, up along the right side of the main church of the sanctuary and onto the square at the top. You will have to do that, too. And that is as it should be. sources: mainly Troccoli (2011). In turn, that work cites the other items in this bibliography. -D'Antuoni, L. (1888) Il Gelbison, Scafati. -Petraglia, L. (1918) Il Gelbison e il Santuario di Novo Velia, Napoli. -Petraglia, L. (1933) Il Gelbison e il Santuario, Napoli. -Ronzini, D.A. 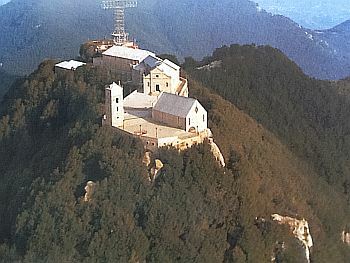 (1854) Brevi notizie sul celebre santuario di Maria SS.ma della Sacra Montagna di Novi, Salerno. -Speranza, G. Arcid. (1893-1911) Annali della Sacra Montagna, vol. II. Tipografia R. Carrozza, Napoli. -Speranza, G. Arcid. 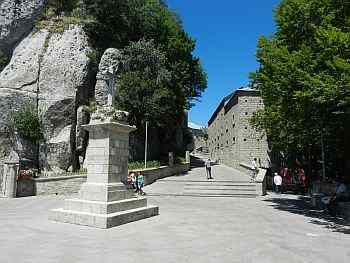 (1906) Storia e Particolari dell'antico e celebre Santuario di Maria SS.ma della Sacra Montagna, Vallo della Lucania. -Troccoli, Carmine. (1986-1) Montesanto antichissimo santuario basiliano, Napoli. -Troccoli, Carmine. (1986-2) Il Pelligrinaggio al Monte, Napoli, 1986. -Troccoli, Carmine. (2011) Montesacro, Tra Storia e cronaca, edizione Montesacro.